Subtitle: The sheer, incomparable power of making meaning. Other subtitle: Anecdotes from my Russian journey. I don’t really know how to answer this. Before I started learning it (this time), I didn’t know anyone who spoke Russian except Natalia, who can speak to me in at least Superior English. I didn’t have any plans to go to Russia. But I did have a need. A year and a half ago, I did a conference presentation in Texas about storytelling. It was one of the first times I conducted a session entirely in Spanish. I could tell that so many of the participants had never seen a storytelling demonstration and hadn’t contemplated how to incorporate storytelling into their classrooms. Afterward, a teacher came up to me gushing about how finally he understood how he could speak high levels of the TL in the classroom and be understood, how he couldn’t wait to get back to his classroom and try it. That’s because you understood everything I said. I know I was speaking in Spanish that was too complex and I let myself do it because I knew everyone there understood me. At that point, I knew I had to finally push my bilingualism to a new journey. I needed to be able to do this in another language, one that was uncommon among my session and workshop attendees. I am not kidding. This is hard. 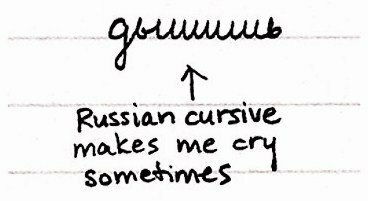 Russian was a natural pick for me because I began learning the language via Rosetta Stone (good if you’re self-motivated, otherwise a really expensive shelf decoration) when I spent two weeks in Russia helping at an English camp for teens in 2008. And because frankly, it’s hard. I feel like I already know a thousand words in Portuguese and at least half that in French just because of my Spanish, which means my audience does, too. I needed Russian because I needed incomprehensible. I needed to remind my participants what it’s like to hang on every word because you are working so hard to figure out what is going on. Which meant I had to step out and do that myself. I’m not kidding. This is HARD. By the end of the summer, it was pretty successful. I’d done this game demonstration three times and participants reported refreshed insight into just how confusing new language can be if it’s not made comprehensible, and just how simple you have to get at the very beginning to make it comprehensible. And then what? Quit learning Russian? But I’d put that much work into it. I still had what’s known as “no measurable proficiency” because I could say random memorized words and phrases but not in connection to anything meaningful, not much anyway. I would say perhaps I was approaching Novice Low. But I’d started. It was time to keep going. So, I started a Russian playlist on YouTube and fell in love with ImprintBand. I pulled my Russian children’s book off the shelf where I put it almost 9 years ago. I started cutting 3×5 cards in half and putting them on a ring clip. Yes, I downloaded Duolingo. And I updated my profile on The Mixxer. Don’t be fooled by the name. The Mixxer is awesome. That’s just the way it is; you just have to memorize it. I’m learning resilience, I’m making a new friend, and I’m learning Russian. And I’m getting reintroduced to a power I’d forgotten: the power of making meaning, of realizing and showing for the first time that I CAN. This book is from the library! One day Lyuda and I were talking. I was doing what I usually do, which is talk to her about this phrase I encountered in a song: Я знаю – “I know,” and talking through a scenario because I don’t know what kind of know this is or if there are lots of knows in Russian! So if we’re together and someone knocks on the door, and you say “Кто там” (who’s there), and I say “Я не знаю” (I don’t know), that works? Just then, my preschooler came up and wanted to show her his superhero book. “This is my book,” he said. “Oh yes,” she said, “I see, you have a Batman book.” But the book wasn’t his, it was actually from the library, and I was about to tell her that when I caught my breath. Wait a minute. This isn’t a scenario, even a likely one. This isn’t a what if I…. 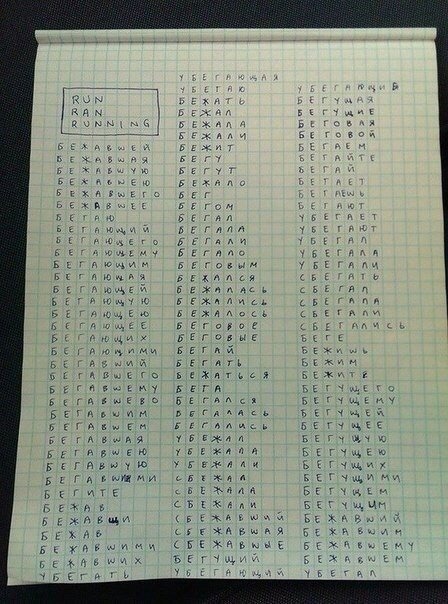 This is something I actually think I can do IN RUSSIAN based on months of previous weekly Skype chats. So I took a deep breath. Oh, so it’s a library book. SHE GOT IT. Now, there are actually two errors there, one involving some spelling change there’s supposed to be on “this” and the other involving the case ending in “library” (A PLAGUE ON ALL YOUR CASES, RUSSIAN). But she GOT IT. You would have thought someone had just handed me a double chocolate ice cream cone. Or a Starbucks card. Or a spa trip. I was pumped. Why? I had made meaning. Not because I was asked to. Not because I even needed to. Because I COULD. I needed to say “This book is from the library.” No, I didn’t even need to. I COULD. That light is too bright! Well, the one behind me. YES! She got it! There’s something wrong with the word that (I think I used this instead) but I wanted to say, “That light is very bright,” and I COULD. Like it or not, “I Need” may be on its way out of the list of motivators. This month, Martina also posted about how comprehensible input is fueling her excitement in her French learning journey, and Megan also encouraged us to remember what it’s like to be a novice. What about you? Do you remember what it’s like to hang on every word trying to catch even the gist of what’s going on? Would a return to learning a language – maybe even a totally unfamiliar, “tough” one – make you a better teacher? I hope this long post with its anecdotes reminds you of what these situations brought back to me: In a world where I need, for English speakers in particular, isn’t going to be much of a motivator for long, the I can still shines. And that light is not too bright.